From the ISIS Lagna chart (previous article), it was obvious that they are trying to establish a kingdom as the lagneśa Mercury is in 9th bhāva (independent) and is also a ātmakāraka (king). Since the ārūḍha is in Libra with Rāhu and Saturn, the manifestation of this ārūḍha shall take place during their period – Saturn daśā Rāhu antardaśā (Apr, 2013 – Mar, 2016). After their initial huge victories, the formation of a Caliphate was declared. ISIS Caliphate chart given below. On June 28, 2014 at 7:05 am the Caliphate was declared at Ar Raqqah, Syria (Zone: 3:00 E, 39 E 01′, 35 N 57′). It was the first day of the lunar month of Āsāḍha and a Saturday showing the manifestation of Saturn-Rāhu energy. The lagneśa Moon, dhaneśa Sun are with 12th lord Mercury – and Saturn is kāraka for this bhāva. The dominant yoga is the deadly Kālasarpa showing that the end shall be very bad, especially as Saturn (in rājabhaṇga nīca yoga) conjoins Rāhu. To add to the woes, the lagneśa Moon is combust. The only saving grace is that of Jupiter, exalted and lord of janma tārā. The tenth house has Ketu aspected by Mars showing piśāca yoga. The tenth lord is ill placed in the 3rd bhāva (battle) and its dispositor has gone to 12th bhāva (loss) and conjoined a combust Moon (longevity). Mars is also in debility in navāṁśa in the 12th bhāva. It is clear that its leaders will fall one after another and that is the manner in which the Caliphate will disappear. The terrible Kālasarpa spells doom for the chart. Firstly, Rāhu is the ātmakāraka and is also the 8th lord. Secondly, Saturn in exalted rāśi and debility navāṁśa is in rājabhaṇga nīca yoga. Saturn conjunction with combust Moon and warrior Ketu in Aries (war) navāṁśa shows the end shall be terrible with many falling in battle. Haṁsa mahāpuruṣa yoga is defunct as the same Jupiter, although vargottama is placed in 12th bhāva in navāṁśa. In addition, the Moon, placed in the 12th bhāva from lagna is combust and is very severely afflicted by debilitated Saturn and Ketu. Venus as bādhaka adds to the woes. In fact, Jupiter favours the enemy and not the native. Every Caliphate must have people to govern and this is indicated by the fifth bhāva, Scorpio. Scorpio is vacant and it has two lords – Mars and Ketu. Mars indicates one part of the population which is in the 3rd bhāva Virgo (battle weary, normal people, farmers) and in debility in navāṁśa (frightened) in the 12th house (fleeing). Ketu indicates another part of the population which is in the 10th bhāva Aries (ruling, militant, violent and headless) that includes the Caliph himself. 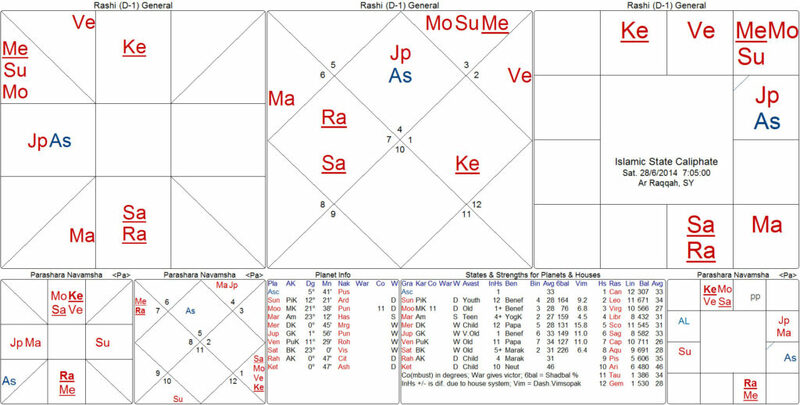 Now, unfortunately these planets are in ṣaḍāṣṭaka (mutual 6th-8th) showing that Ketu shall punish Mars and Mars must keep paying all sorts of debts, in cash and flesh, that a headless Ketu extracts. ISIS has been tightening security along the borders of its “caliphate” to prevent people from fleeing and have started forcing people to register with the de-facto government. People are terribly scared of the forced recruitment drive and are fleeing. Women below 45 and boys below 19 are prohibited from leaving Ar-Raqqah. The area that is controlled by the terrorist organization has one road that civilians can go out from, and they open it in specific dates and times. They have various tactics for blocking the exodus. “In Mosul, ISIS requires anyone leaving the city to provide the militants with the names of relatives who can vouch for their return” reports The New York Times. If the person does not return, their relatives are arrested. The New York Times reported that a “cottage industry” of smugglers have cropped up to extricate people from ISIS territory. We apply ādhana vimśottari daśā when the Moon is very weak in the 8th or 12th bhāva. The ādhana vimśottari daśā of Mars shows that the people will continue to be beaten and will flee until something is done. In fact, this will become the common cause for the world to take up arms against the Caliphate. With the advent of Saturn antardaśā the enemy (World forces, A6 in Aquarius) will start dealing crippling blows to the Caliphate (Saturn in 6th bhāva from AL is in nīca navāṁśa) and their territory will shrink considerably (Saturn in 4th bhāva). Many of their leaders (Saturn in rājya-aṁśa i.e. Aries navāṁśa which is 10th bhāva of rāśi chart) will be felled (Sat in debility with Moon + Ketu) by enemy aircrafts and battles (Ketu in Aries). The battle is going to be long drawn due to many squabbles between the World forces (śatrupada A6 Lords Saturn and Rāhu are in bādhaka sthāna from A6 which causes troubles due to vidveṣaṇa). They need to improve their coordination, talk together and have a clear focus – elimination of the terror-government that threatens to take the world back to the dark ages. Guruji, one question. Do we take 8 Chara karakas scheme for non living mundane charts also ?